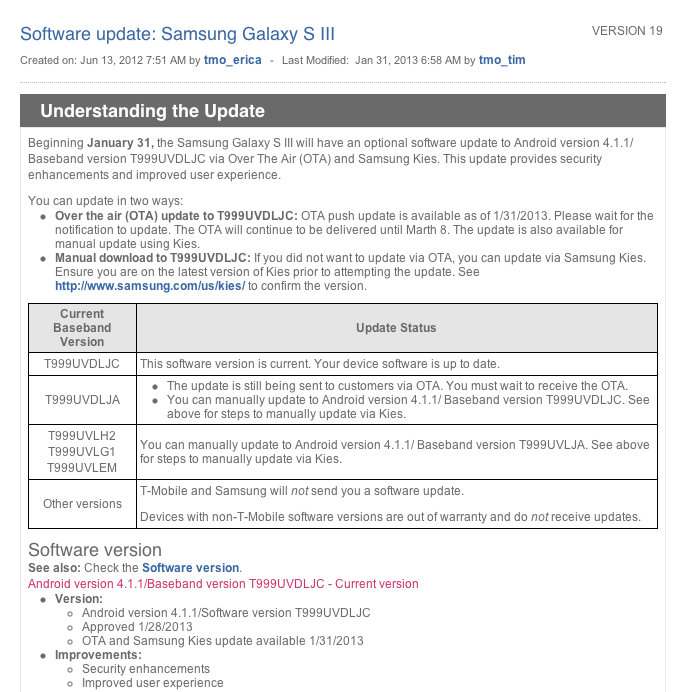 Galaxy S III owners should keep an eye out for an incoming software update bringing your device up to Android 4.1.1 baseband T999UVDLJC. This update will bring “security enhancements and an improved user experience” according to T-Mobile’s support documents. Unfortunately, there isn’t a lot of detail on the “improved user experience” and what exactly is improved. Regardless, the update is coming via a OTA (over-the-air) update beginning today or you can attempt a manual update via Samsung’s Kies software on your desktop. If you notice any changes, drop word below and we’ll update the post. Wow, I got the update before the article even came out! It was already waiting for me when I woke up around 6:30 this morning…but of course, it was complaining that it needed to be charged before it could go through with it lol. IPv6, previously broken in T999UVDLJA, is now fixed in T999UVDLJC. Absolutely not true. The current gs3 doesn’t not have the capability to run LTE, the hardware is simply not there. While the settings said LTE, the hardware isn’t there to support it. If anything you should be ashamed that you’re spewing ignorant comments and misleading others. People like you are the reason behind warning labels. Pity a barbarian like yourself has access to Internet. It did remove the mention of lte from the mobile network settings. I didn’t refute this, but what I wanted to clarify was that the phone simply doesn’t not have the HARDWARE to run LTE, so even though it said it briefly, it didn’t mean the phone was anymore LTE ready than it was the day before. If anything, it was removed to quell confusion. The only device as of now that is truly LTE ready is the note 2 which, yes, has the hardware to support LTE. I get it. I was under the impression when I originally bought the phone (right after release) that it DID have the lte hardware and it would get enabled once they rolled out the network. Still sad about that. Anyway, anyone know what this update does besides fixing ipv6? if you’d look at the chip setting from at&t and verizon LTE galaxy S3 it is exactly the same as our T999 for T-Mobile…our phone does have the proper chip setting to run LTE and yes T-Mobile is blocking the feature with this security update. Just because it has the same chip doesn’t mean it has the proper signal amplifiers to make it worthwhile. it did have software/chip/frequency/wave length/spectre whatever you want to call it before but it will not after this update, it’s being turned off. until the newer GS3 LTE comes out and the 4.2 being rolled out then the LTE option “might” get unlocked again. Ha, so I was told the right thing originally – the phone is capable. After hearing that, why would I update then? None of what you said sounds beneficial!! They fixed the IPv6 bug in this relase! Unfortunately, no – IPv6 is still broken. You’ll be able to use the connection for a minute or two before it drops. Mine just showed up in Kies. I updated around 3am I was so happy I thought it was 4.1.2 r 4.2, and then I was sad…. That’s strange since I recieved 4.1.1 a month ago. T-mobile USA. Even friends on AT&T got it then. This article is dated January 31, 2013? I suggest reading the full article before commenting. Did you notice a radio update? Has anyone successfully updated on a rooted phone? So far, no… I un-rooted with Voodoo OTA Rootkeeper, checked that my flash counter was still at 0 (it is), rebooted, and the software updater still claims my device has been modified. Yep, using “Triangle Away” and it’s “tracker” mode let the updater run without complaints. Re-rooted w/ Voodoo OTA Rootkeeper after updating. guys does that have to do anything with the lte? and is samsng galaxy s3 provided by T-mobile lte ready? The original Samsung Galaxy S3 is not an LTE ready device. it does not have the internal hardware to work. T-Mobile will be releasing a new version of the Galaxy S3 that will be LTE compatible soon. It removed the Lte from the network options…. To share Photospheres, just upload them to Google Maps! Tmobile customers service said the software update is to remove the LTE from your device go t-mobile screwing your customers again. I don’t understand why Samsung just doesn’t give the S III 4.2 already? Are there plans for it or we just wasting our breath? I think they just had it with US carriers more than anything else. There are too many things they have to do to please all the carriers that it makes it way more difficult for Samsung and other manufacturers. I gave up trying to anticipate upgrades to the OS. If it happens, it happens. If you really want the latest version of Android, learn to root and mod at your own risk. If not, wait like everyone else. Just don’t hold your breath. You do realize that the International version doesn’t have it either, right? That kinda sticks a fork in your logic. Well that kind of does. LOL. But I still like Samsung. Can’t wait for the S4. Agreed! I remember how much the comments on here used to rail against Samsung’s updates and how great HTC was. I find that funny now. If you want the updates fast, get a Nexus device, simple as that. If you buy ANY other phone, don’t expect a newer version of Android than what it came with. If you get an OS update, great, and if not then you already had the right expectation. You nailed it. It really complicated with upgrades when it comes to Android and the multiple manufactures out there. If you change your mindset to never anticipate new OS versions, and accept the one you have when you buy the phone. You won’t be let down. That’s the beauty of rooting, or just buying a Nexus. And as far as HTC goes. I am done with them after the TMO Sensation. HTC is known for “premium” products, but I personally think Samsung is more premium. And the good thing about Samsung products. If you own multiple device of their products, like TVs (Samsung Smart TVs) the phone works in harmony it. So for me. Sammy is the only way I want to go in the future. Call me a Sammy fanboy. Hey Apple isn’t the only one with fanboys! LOL. Nobody has 4.2 other than Nexus. Stop whining or go get a Nexus. I hope improving user experience by fixing IPv6 bug and removing LTE in the Network mode wasn’t the only thing they did. Cause those two are not improving my user experience. LOL. searching. Does anyone know how to fix this? install kies on your computer and manually install it. It only takes 15 minutes. I installed the update using Kies at home. It took forever, but it worked ok. My question is that even now, when I go to system and click on check updates. Instead of telling me that my software is up to date, it just gets stock on checking. It wont do anything else other than get stock checking for updates. Anyone else having the same issues. Factory Reset, then let us know if you have the same problem. Factory reset corrected the issue. Now I just have to spend the next 4 hours getting all my stuff back in order. what should i do my tmobile contract on 2 of my lines are up (classic family plan) but one of my lines has 12 months left. Should i update now stay in classic plan or go value. SO confused. btw any one know when the next good phone is coming out? For anyone that has updated and uses Google voice, does this fix the access number showing instead of the actual number dialed? I was hoping it would fix the proxy server issues I’m having with my S3. Has anyone else had that problem? If so can you help me fix them please? well an update is always good? Children, give it a rest. The current SGS3 DOES NOT, repeat DOES NOT.. support LTE. I had doubts myself. I read the ongoing thread(s) about it on XDA-devs. Believe me, if someone over at XDA-devs says its not capable.. it isn’t. Our phones have the qualcomm MSM8960 BOARD, (which IS LTE ready, and COULD possibly be hacked). The PROBLEM with atleast the T-MOBILE version of the current SGS3 is that the MODEM HARDWARE is an MSM8260A. This modem COULD use the LTE technology if the carrier requests it. That being said.. when the SGS3 was designed, T-mobile had no LTE. Would you be happy paying for features that you cant use? people are ALREADY bitching because, even though the SGS3 is 4G capable, some ONLY get 2g in their service area. I remember being pissed when t-mobile pulled the same crap with the Vibrant. They release the t959V . The phone had FFC i believe, and some other features the original vibrant should have had on day 1. It’s all marketing schemes to drive up their profit margins. Just like the talk of making the original vibrant a 4g phone. It would have required alot of swapped hardware and countless hours of reprogramming. Since the bjellybean update my S3 wont play MP3s any one else have this issue? I also cant download any to my phone from my podcast site without it failing out. Worked perfect before tho. Is the low light shooting mode in camera new or was that there before. Doh. This update is like saying… buy this car, it has a steering wheel but you cant use it to turn right or left. For Security reasons, we have disabled the the car from starting…enjoy the ride…sucker!